a main encampment providing supplies, shelter, and communications for persons engaged in wide-ranging activities, as exploring, reconnaissance, hunting, or mountain climbing. Solitude makes a perfect base camp for the activities found in northern Colorado. The Best Family Gift Is Time Spent Together! 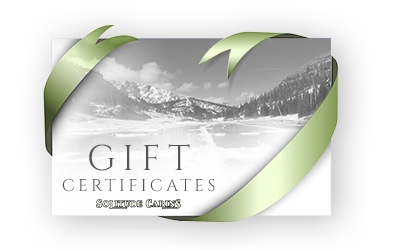 Gift Cards Now Available! Tell us when you want to visit and how long you’ll be staying with us; we’ll handle the rest. Our aim is to make your trip uniquely yours. Call us today to design your ultimate getaway. We look forward to hosting you. From a breakfast basket to delicious crockpot dinners, we believe your Colorado experience begins with the comfort of Solitude Cabins. Allow us to deliver your choice of Syrah or Riesling wine to your cabin. If there’s a way we could personalize your stay, call our team today. Solitude Cabins offers a rate to fit every budget and time of year, whether you want to get away in the winter for a snowy adventure, or your prefer to enjoy the colorful hiking trails of the summer. We do offer discounts and package specials, so please contact us well ahead of your trip to learn more. Our cabins comfortably house up to six guests. Solitude Cabins is the perfect location to enjoy scenic views, resident wildlife, and the surrounding adventures. View our gallery of the Solitude Cabins neighborhood and envision your relaxing stay. Our Estes Park cabins are a four-season retreat in the Colorado Rockies. Solitude Cabins offers fully furnished, private Estes Park vacation rentals with two bedrooms and two bathrooms that sleep up to six people. Each tastefully decorated cabin is 1,200 square feet.